Harlem Globetrotters star Champ Thompson brought the “T.E.A.M up at School” program to Chisholm Elementary School in North Enid on Friday. 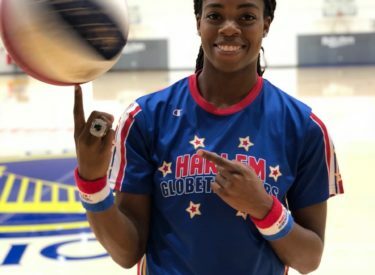 NORTH ENID, OK — In anticipation of bringing their upcoming game to Enid, Harlem Globetrotters star Champ Thompson brought the “T.E.A.M up at School” program to Chisholm Elementary School in North Enid on Friday. The fun, new and interactive presentation aims at providing students with bullying solutions through the acronym T.E.A.M. — that stands for Talk, Empathize, Ask and Mobilize. This program was designed in coordination with the National Campaign to Stop Violence. The team’s signature ball handling skills and humor also made an appearance – for a well –balanced presentation.